Nowadays whatever you need chances are there’s an app for that. And traveling apps are no exception. From getting the best seat to finding the cheapest gas, here’s a list of 13 travel apps that will make planning your next trip easier. 1. GateGuru: Don’t have time to scour the airport for something to eat? This app lets you know exactly what you’re getting into. Maps, ratings and reviews, help you find the best shops and restaurants. Don’t waste a minute searching for something better. Who needs this: Business travelers with layovers and downtime. 2. Seat Alerts: Expertflyer.com created this app to help you find the best seats on your flight. View the seating chart and read reviews to get a better idea of where you’ll be spending the next few hours. The app sends alerts with preferred seat availability up until departure. Who needs this: Perfectionists who know what they want when they travel. 3. LocalEats: Don’t get fed by tourist traps. This app takes in media reviews and recommendations to let you eat like a local. Find hidden gems with directions. Who needs this: Tourists looking to find local cuisine. 4. Urbanspoon: Go ahead, give it a shake. 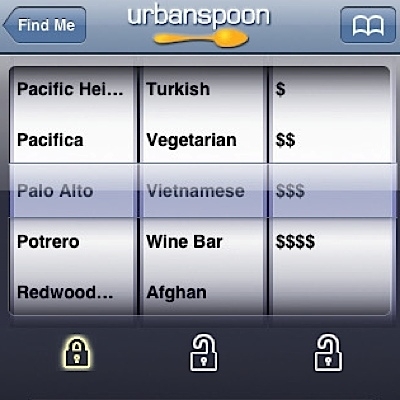 Search by city and cuisine type to find your next meal. Once a restaurant pops up, read reviews and decide if it’s what you want. If not, simply shake and try your luck again. Or just shake for the heck of it, it’s fun either way. Who needs this: Travelers looking to discover new cuisines or explore new neighborhoods. 5. Dcovery: This app lets you personalize your itinerary by saving snippets from your desktop. Simply sync your phone to your computer, and the app creates a personalized travel guide using the your saved articles. Who needs this: The ultra planner who wants every detail laid out before their trip. 6. HistoryHERE: Find thousands of historic locations with this interactive app created by The History Channel. History buffs can instantly discover hidden information about historic sites and share with their friends. Who needs this: History lovers that want access to historical sites and information. 7. 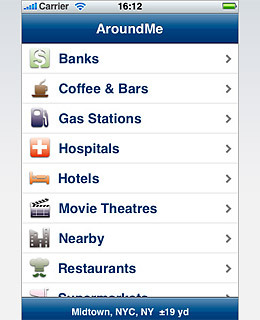 AroundME: Just as the name describes, find anything you need wherever you are. Take money out of the nearest ATM, fill up at the closest gas station or grab a beer at a bar to pass the time. Use the map to quickly find what you need. Who needs this: Explorers always finding themselves in new locations. 8. ICE: You never know what will happen when you travel, especially alone. So be cautious. Store medical information including insurance details, doctors phone numbers and history in case you need it. Who needs this: Anyone traveling to unfamiliar territory. 9. GasBuddy: A “community of users working together to update gas prices.” Users update the app with the latest gas prices, so that you can quickly find the best deals. Who needs this: Budget conscious drivers. 10. Roadtrippers: It’s not the destination, it’s the journey, right? This helps you map out the best journey possible by pointing out worthy stops and sites along the way. It should make your car ride a little more interesting. Who needs this: Road trippers with a long drive ahead of them. 11. Waze: A personal favorite of the Hotel Engine team. This is not your typical GPS app. Waze lets users interact with each other to get up to date alerts on traffic and construction and helps you find the fastest route. It even notifies you of traffic cameras. Who needs this: Drivers constantly trying to avoid traffic. 12. Google Translate: Use voice command or have your phone speak for you. Text found on menus or signs is quickly translated for you. Who needs this: Travelers heading to a foreign land with an unfamiliar language. 13. 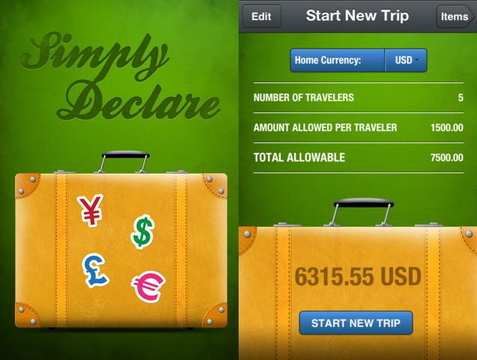 Simply Declare: This app makes it easy to set a budget and keep track of your purchases abroad. If you don’t know the local currency it will give the exchange rate for every item as well as take a picture of receipts to create an easy record of your spending. Who needs this: The savvy shopper on a budget. Plenty of travel apps are available right at your fingertips, so why not use them? Take advantage of these available apps to be sure you’re making the most of your next trip.